Ryan Galiotto’s interest in finance and investing began in a unique way. Today, he joins the show to share how he found his love for finance so early on and his journey into the corporate world. Ryan has some great information and tips on how to transition investment-centric clients to full financial planning, as well as how he is transitioning into taking over the firm. Listen in to hear Ryan's full story, from the initial opportunities to the hard work he had to put in in order to get to a place where he’s comfortable and on track to owning a firm. He also gives solid advice on how to structure meetings, changes and transitions with your clients and shares details on client changes, acquisition, referrals and more. An overview of Ryan's practice and what they do. How a dishwasher got him interested in finance. The connection that helped him break into the financial services field. How he balanced work and studying for the CFP. The importance of having someone to mentor and teach him. How Ryan's firm is structured and how they operate with a broker-dealer. How and why he transitioned from investment-centric to comprehensive financial planning. Why it's important to change with the needs of your clients. How Ryan structured the transition conversations with clients. His firm's fees and how they have changed with the transition. How they are acquiring more clients and referrals. How they help younger clients and work with student loans. The process of transitioning to taking over the firm in the future. Ryan's plans and vision for the future of the firm. His best advice from his experience so far. Are you the Chief Marketing Officer of your RIA? Do you have a love-hate relationship with marketing? Do you understand the importance of marketing your firm, but have no idea where to start? If you answered yes to any of these questions, you need our free Marketing Funnel Download. If you have a leak in your funnel, you could be spinning your wheels, missing opportunities, and gaining little traction. 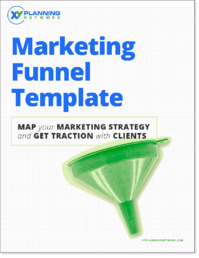 Use our free template to map your funnel and get a clear picture of your strategy. Visit xyplanningnetwork.com/funnel to download the template.